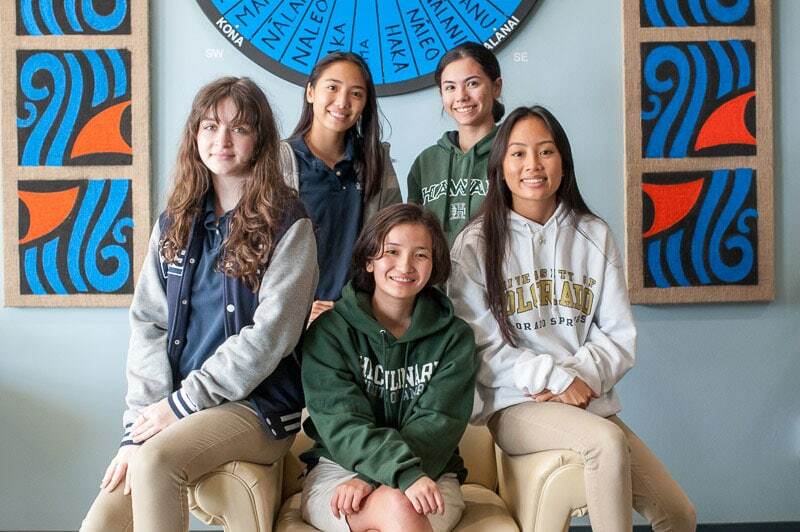 Five ISLAND PACIFIC ACADEMY students received honors for their work at the 2019 Hawaiʻi Regional Scholastic Art Awards. This annual award contest, now in its 56th year, is sponsored by the State Foundation on Culture and the Arts (SFCA) and the Hawai’i State Art Museum (HiSAM). It offers students in grades 7-12 an opportunity to showcase their artwork and talent, and is part of the national Scholastic Art and Writing Awards program sponsored by the non-profit organization, Alliance for Young Artists and Writers. Also recognized for their work were Mina Cintron (’20), who received two Honorable Mentions (Drawing & Illustration), and Lina Finley (’20), who received an Honorable Mention in Mixed Media. Diploma Program Art teacher, Jené Komine, encouraged the students to submit their work to the award contest. “I could not contain myself when I got the email stating that all 5 of our students who entered placed or got honorable mention! All year long they work hard technically and conceptually, so it’s the icing on the cake to be recognized, especially on the state level,” shared Komine. 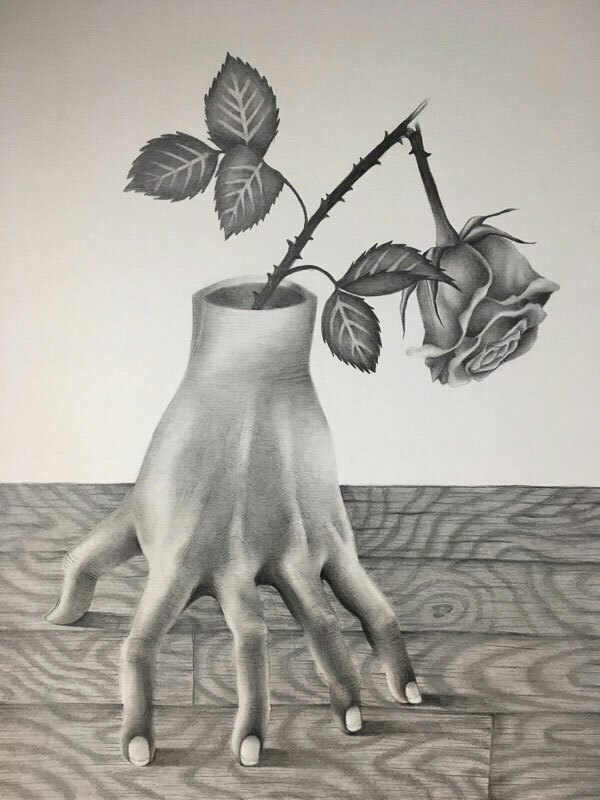 The Gold and Silver Key winners will have their artwork displayed at the 2019 Hawaiʻi Regional Scholastic Art Awards Exhibition from February 16, 2019 through April 19, 2019 at the HiSAM. The exhibition is open to the public. An awards ceremony honoring student nominees and their teachers will be held on Saturday, March 16, 2019 at HiSAM from 3:00pm to 5:00pm. While all artists get their start in different places, many young artists who are coming into the age of the internet will stumble upon tutorials teaching them how to draw anime characters. 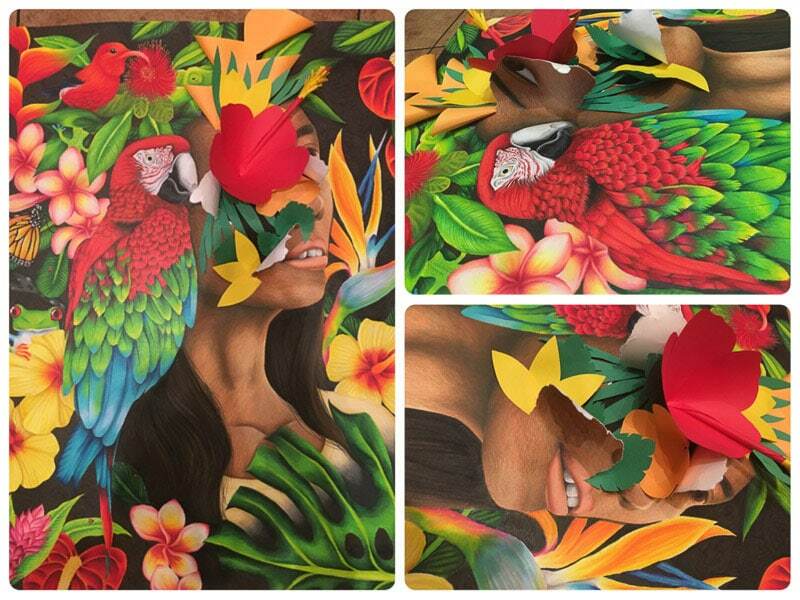 Many outgrow their styles as they become more serious in art, but the influence still lingers. Anime itself is shunned in the fine art community, and young artists trying to make it in the art world find that they are unable to receive valid criticism and judgement. The style is deemed to childish, too foreign, too amateur. Art is about the bold, the new, the exciting, and has historically opened it arms to the things that the world has shunned. Why should anime and cartoons be any different? I myself have been trying to develop my own style, I owe my routes to anime. In this piece, I go back to the time where I saw the style as something beautiful and revered, not as something embarrassing. 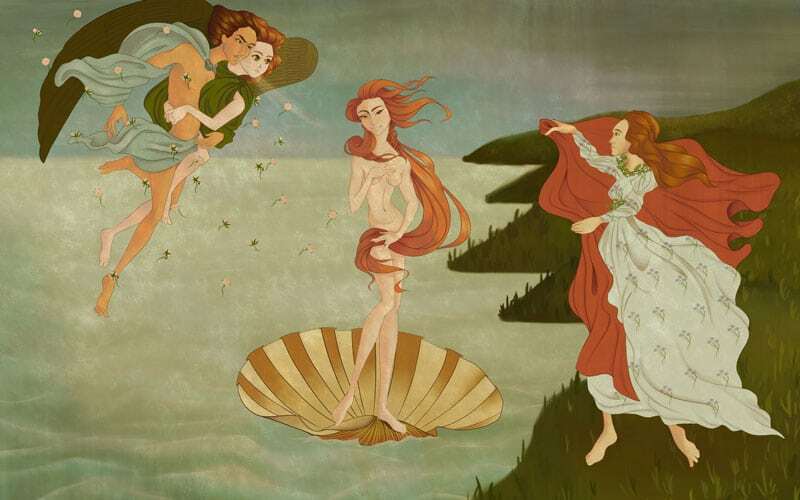 This piece is a recreation of The Birth of Venus, created by Sandro Botticelli. Using modern Japanese influences such as Takashi Murakami and YKBX, I turned this famous piece into something my own: a celebration of the differences that create art. 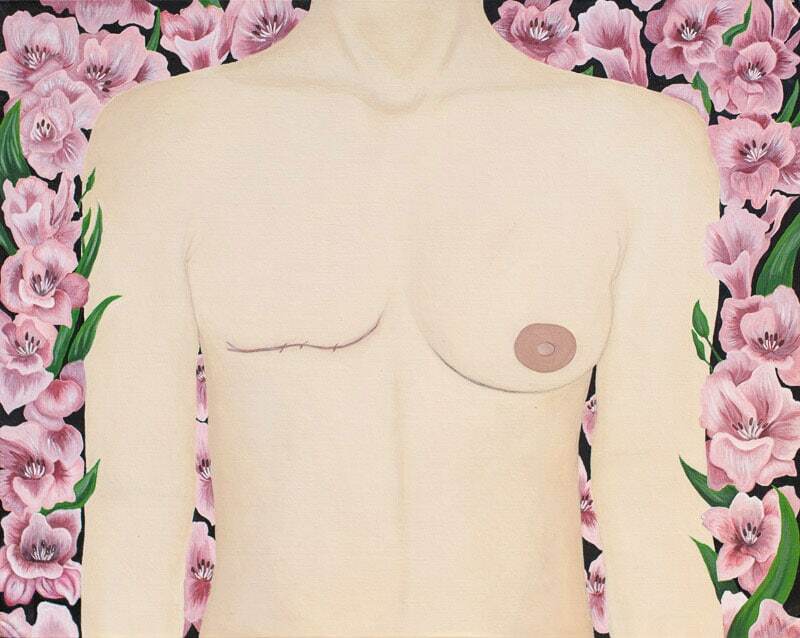 Last year, my mom was diagnosed with Stage II breast cancer in her right breast. Over months of chemotherapy, she slowly lost her hair, her strength, and her ability to carry out simple tasks both and home and at work. At her weakest point, she decided she did not want to continue chemo however, with continuous support from family and friends, she was able to finish all her sessions. This piece was made for her to acknowledge her strength and endurance and it became an opportunity for me to take a life changing experience to create something beautiful. SeaWorld has been responsible for the deaths of at least forty-eight orcas since the animal was first brought to the parks. The deaths are caused by a multitude of things, but they almost all come down to one fact, wild animals are not meant to be kept in captivity. They are confined to the human equivalent of a bathtub and often get intense sunburn because of how shallow the water is. On top of that, they are forced to spend hours of their day training unnatural tricks and spectacles for shows they gain nothing from. The average life span of an orca in the wild can be close to fifty years, when they are raised in SeaWorld, that number drops to thirteen. 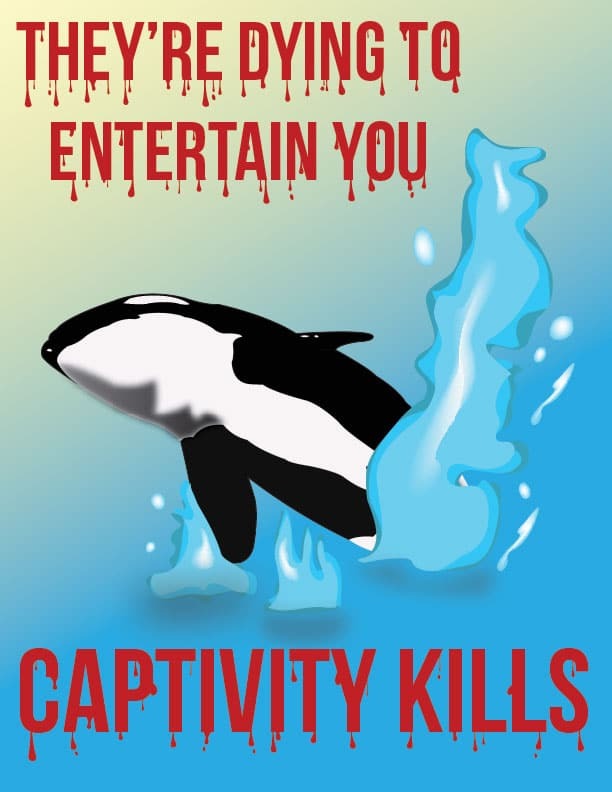 SeaWorld and its various animal shows are advertised as nothing short of spectacular, but many forget at what cost. The roots of nature depends on the hand that takes it. The connection people have with nature will always influence us. 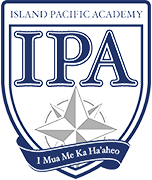 For as long as we live, the life of the Hawaiian Islands will always live within us. Music has always been a huge part of my life and without it, I wouldn’t be the person I am today. Music can help you through tough times and help you connect with your thoughts. My piece shows how playing music can connect you with your soul and put you in a state of ease, as well as how music can help you escape reality. 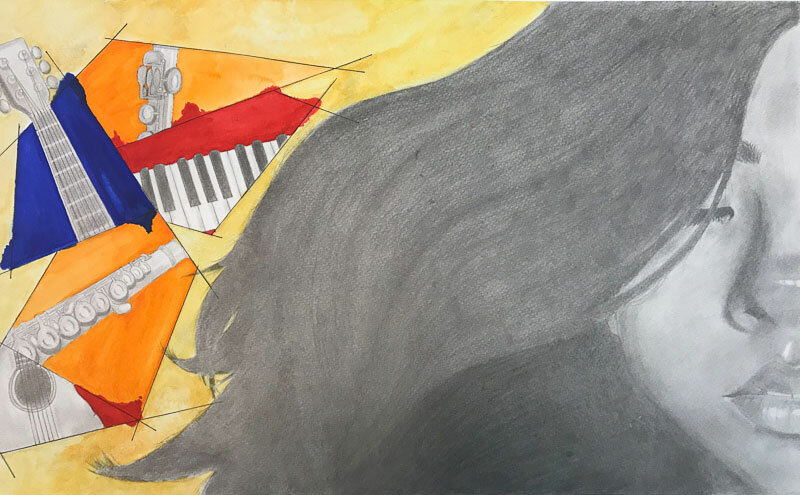 While I drew my portrait in graphite pencil to express how dull reality can be, I put the background and the background of instruments in color to show that simple instruments can create a world of imagination. The colors of music can also help a musician convey what they are feeling just by changing the tone of the notes a person is playing.